This packet contains, as far as could be found, all statements issued by the First Presidency of the Church of Jesus Christ of Latter-day Saints on the subject of evolution and the origin of man, and a statement on the Church’s attitude toward science. The earliest First Presidency statement, “The Origin of Man,” was issued during the administration of President Joseph F. Smith in 1909. This was followed by a First Presidency Message in 1910 that included brief comments related to the study of these topics. The second statement, “Mormon View of Evolution,” was issued during the administration of President Heber J. Grant in 1925. Although there has never been a formal declaration from the First Presidency addressing the general matter of organic evolution as a process for development of biological species, these documents make clear the official position of the Church regarding the origin of man. This packet also contains the article on evolution from the Encyclopedia of Mormonism, published in 1992. The current First Presidency authorized inclusion of the excerpt from the First Presidency minutes of 1931 in the 1992 Encyclopedia article. Various views have been expressed by other Church leaders on this subject over many decades; however, formal statements by the First Presidency are the definitive source of official Church positions. It is hoped that these materials will provide a firm foundation for individual study in a context of faith in the restored gospel. Approved by the Board of Trustees, June 1992 (from page 1 of packet; emphasis in original). THE ORIGIN OF MAN, by The First Presidency of the Church…. When the divine Being whose spirit-body the brother of Jared beheld, took upon Him flesh and blood, He appeared as a man, having “body, parts and passions,” like other men, though vastly superior to all others, because He was God, even the Son of God, the Word made flesh; in Him “dwelt the fulness of the Godhead bodily.” And why should He not appear as a man? That was the form of His spirit, and it must needs have an appropriate covering, a suitable tabernacle. He came unto the world as He had promised to come (3 Nephi 1:13), taking an infant tabernacle, and developing it gradually to the fulness of His spirit stature. He came as man had been coming for ages, and as man has continued to come ever since. Jesus, however, as shown, was the only begotten of God in the flesh. 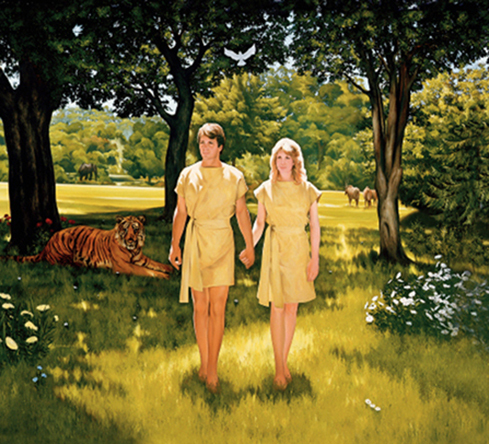 Adam, our progenitor, “the first man,” was, like Christ, a pre-existent spirit, and like Christ he took upon him an appropriate body, the body of a man, and so became a “living soul.” The doctrine of the pre-existence,--revealed so plainly, particularly in latter days, pours a wonderful flood of light upon the otherwise mysterious problem of man’s origin. It shows that man, as a spirit, was begotten and born of heavenly parents, and reared to maturity in the eternal mansions of the Father, prior to coming upon the earth in a temporal body to undergo an experience in mortality. It teaches that all men existed in the spirit before any man existed in the flesh, and that all who have inhabited the earth since Adam have taken bodies and become souls in like manner. The Church of Jesus Christ of Latter-day Saints, basing its belief on divine revelation, ancient and modern, proclaims man to be the direct and lineal offspring of Deity. God Himself is an exalted man, perfected, enthroned, and supreme. By His almighty power He organized the earth, and all that it contains, from spirit and element, which exist co-eternally with Himself. He formed every plant that grows, and every animal that breathes, each after its own kind, spiritually and temporally—“that which is spiritual being in the likeness of that which is temporal, and that which is temporal in the likeness of that which is spiritual.” He made the tadpole and the ape, the lion and the elephant but He did not make them in His own image, nor endow them with Godlike reason and intelligence. Nevertheless, the whole animal creation will be perfected and perpetuated in the Hereafter, each class in its “distinct order or sphere,” and will enjoy “eternal felicity.” That fact has been made plain in this dispensation (D&C 77:3). Deseret Evening News, December 17, 1910, part 1, p. 3. The following is the complete text of the quotation from the First Presidency minutes given immediately above, which actually includes three paragraphs and was edited for the packet. We call attention to the fact that when one of the general authorities of the Church makes a definite statement in regard to any doctrine, particularly when the statement is made in a dogmatic declaration of finality, whether he express it as his opinion or not, he is regarded as voicing the Church, and his statements are accepted as the approved doctrine of the Church, which they should be. Upon the fundamental doctrines of the Church we are all agreed. Our mission is to bear the message of the restored gospel to the people of the world. Leave Geology, Biology, Archaeology, and Anthropology, no one of which has to do with the salvation of the souls of mankind, to scientific research, while we magnify our calling in the realm of the Church.